"Alice doesn't know what she wants." Open Road Films has unveiled a teaser trailer for a new comedy titled Home Again, the feature directorial debut of young filmmaker Hallie Meyers-Shyer. The spunky original Hollywood comedy is about a recently divorced woman who moves back home to Los Angeles with her two young daughters. She decides to take in three aspiring filmmaker boys who share her place with her, and disrupt things in both good ways and bad ways. Reese Witherspoon stars, along with Michael Sheen, Lake Bell, Candice Bergen, Nat Wolff, Jon Rudnitsky, Pico Alexander, and P.J. Byrne. This is a nice teaser, a good introduction with just the right amount of footage. I don't even need to see a full trailer. Recently separated from her husband, (Michael Sheen), Alice (Reese Witherspoon) decides to start over by moving back to her hometown of Los Angeles with her two young daughters. During a night out on her 40th birthday, Alice meets three aspiring filmmakers (Jon Rudnitsky, Pico Alexander, Nat Wolff) who happen to be in need of a place to live. Alice agrees to let the guys stay in her guest house temporarily, but the arrangement ends up unfolding in unexpected ways. Alice’s unlikely new family and new romance comes to a crashing halt when her ex-husband shows up, suitcase in hand. 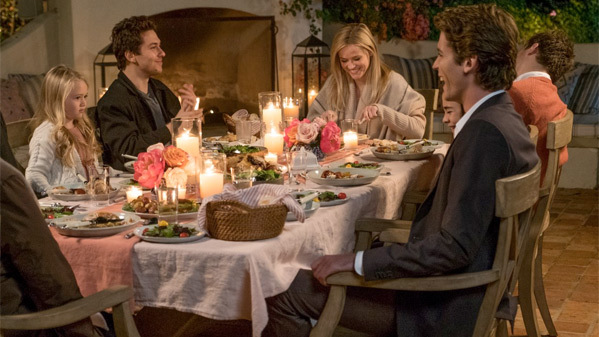 Home Again is both written and directed by young filmmaker Hallie Meyers-Shyer, making her feature directorial debut with this. Open Road Films will release Home Again in theaters starting September 8th later this fall. Anyone interested?